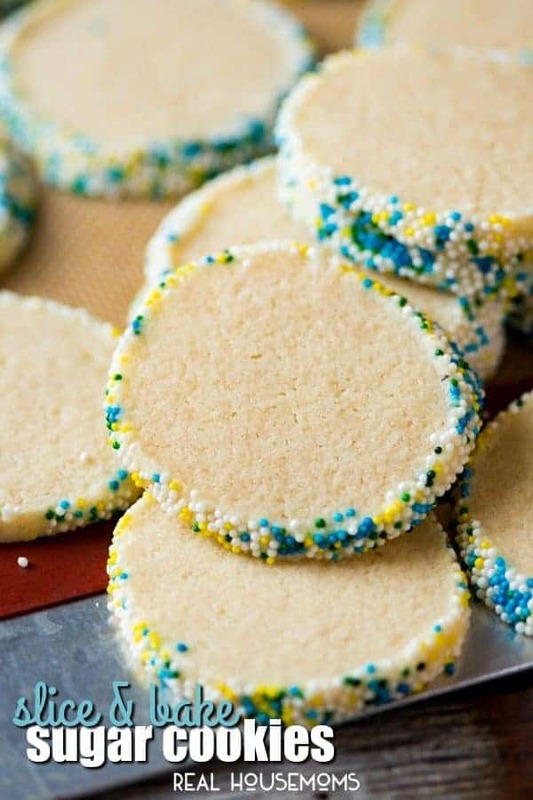 It takes just 5 minutes to whip up these classic Slice and Bake Sugar Cookies! Roll the dough in festive sprinkles for any occasion! Love it?! Pin it to your DESSERTS pin board! 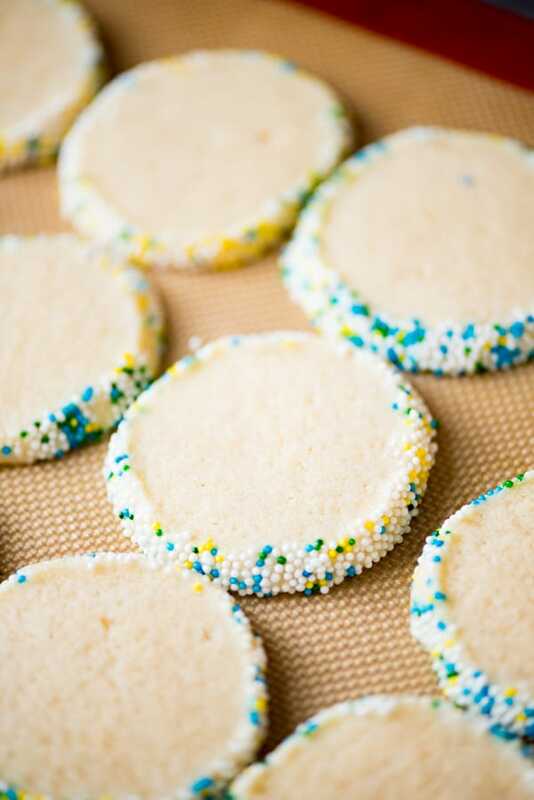 Nothing says classic comfort food like sugar cookies. I have fond memories of my early married days (you know…those pre-child days when I thought I was too busy for baking), when my husband and I would run to the grocery store for a tube of refrigerated sugar cookie dough. Sometimes we’d be wild and crazy and buy chocolate chip. But our favorite? Classic Slice and Bake Sugar Cookies. Three kids later and 14 years of playing taxi-mom and I’m more than happy to skip that quick trip to the grocery store for sugar cookie dough. 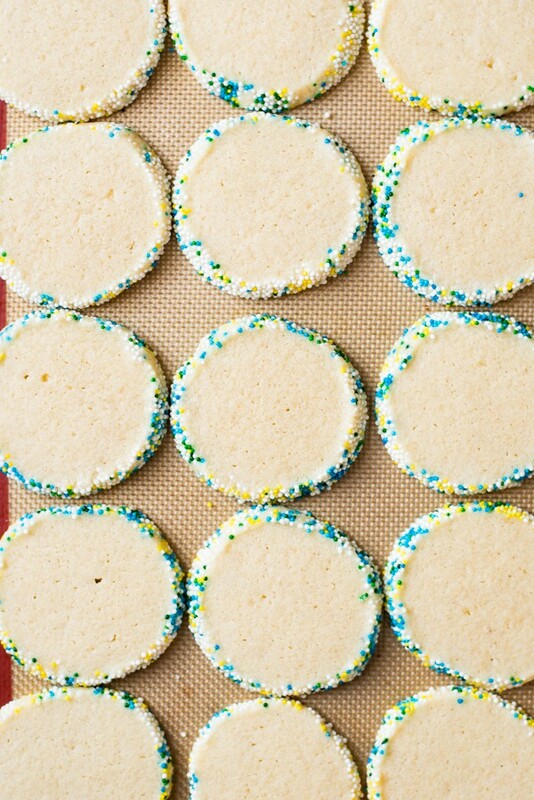 I’ll take a quick homemade sugar cookie recipe over a grocery store run any day. These cookies will take you just 5 minutes to whip up. After you have the dough mixed well, you’ll roll it into a thick log, about 8-10″ long. Be sure to pack this cookie dough roll tightly you don’t end up with air pockets in your cookies. Choose your favorite sprinkles and roll that dough back and forth in the sprinkles until the outside of the dough is completely covered. Don’t you love sprinkle cookies? Sprinkles make everything better. Wrap the sprinkle-covered cookie dough roll in plastic wrap and refrigerate the dough for 2-3 hours. Chilling the dough allows that butter to harden again so that the cookies don’t spread too much while baking. And while the cookie dough is chilling, you can kick back with a cup of coffee and your favorite book if you have the chance. Once the dough is chilled, they are easy to slice up. Be sure to keep the dough refrigerated until it is ready to bake in the oven. Can’t you picture these slice and bake sugar cookies with red & pink Valentine’s sprinkles…or red, white and blue for July 4th? 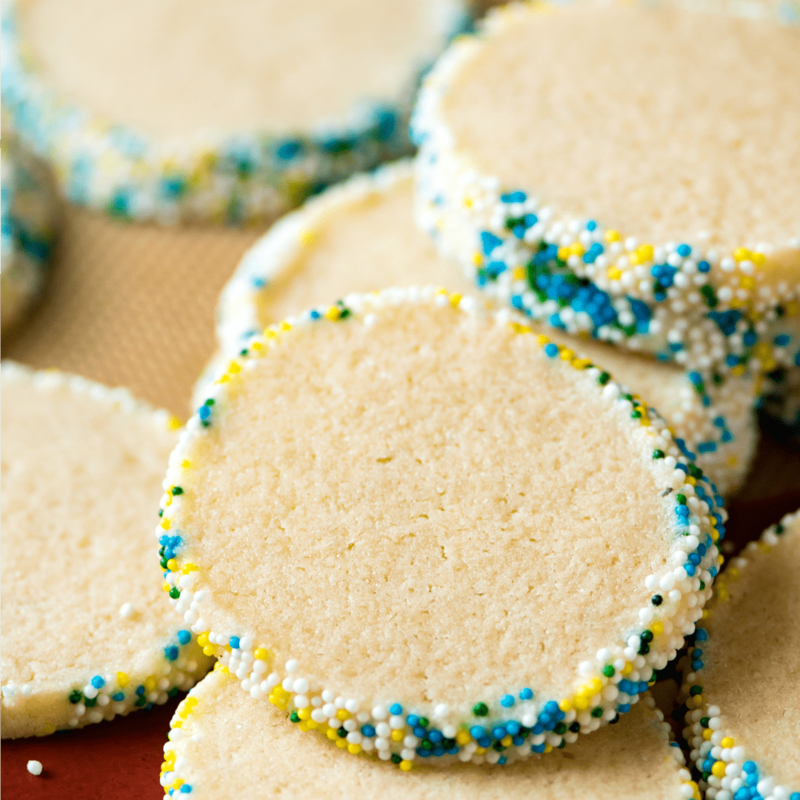 It takes just 5 minutes to whip up these classic Slice & Bake Sugar Cookies. Roll the dough in festive sprinkles for any occasion. Can the slice and bake cookies be frozen? And if so, how long would be the longest you would keep safely in the freezer? Yes, they can be put in the fridge for up to a week or frozen up to 4 months. Be sure to get the dough packed tightly. Is it correct that no leavening agent (like baking powder or baking soda) is needed for this recipe? Thank you. Your photos made me jump at the chance to try this out, something different and elegant! I followed your instructions exactly, even keeping the dough refrigerated between baking batches so the butter would stay hard. Yet my cookies spread out so much while baking that all the sprinkles were in a ring on the bottom of the cookie, not visible unless you turned the cookie over. Not sure what went wrong, at least they tasted great! Before baking mine looked like your photos, just not after. I’ll probably try again, next time going with the absolute thinnest possible slices I can make and see if that makes a difference since for me this time the 1/4″ slices didn’t work out.